Over the course of the years 2010 & 2011, AAF field officers met with several rural communities in Kenya, specifically in areas that have issues with clean water. At the top of the list of the problems facing these rural communities was the desperate need for greater and more efficient access to clean water. Much of rural Kenya typically receives less than 800 millimeters, or 31 inches, of rainfall per year, rendering these areas arid or semi-arid. The dry season, which occurs from June to October, requires water storage for many communities in rural Kenya. Yet, to date, there has been little funding for water assistance projects, and much of the cleanest water around-that which falls from the sky in the form of rainwater-has been left unharnessed. While water is often taken for granted in the global North, in places such as rural Kenya, it is often seen as one of the most valuable commodities. As basic as it may seem, in order for the community to properly function, it requires access to clean water for crop production, bathing, cooking, cleaning, and drinking. Without clean water, communities, like those visited by the AAF field teams in rural Kenya open themselves up to outbreaks of water-borne illnesses, which can affect human well-being, as well as precious food supplies. The risks of extensive outbreaks of waterborne diseases like cholera, typhoid, hepatitis A, and diarrhea diseases are caused by inadequate water and sanitation. Drying water sources forces people to use heavily contaminated water thereby resulting in water borne diseases if ingested. Such diseases-like dysentery, cholera, and typhoid-count for 80% of all rural diseases in Kenya. The seasonal migration of families and workers to urban areas during dry seasons is also common in rural Kenya. These migration patterns lead to the spread of communicable diseases such as HIV/ AIDS. Drought periods, seasonal dry seasons, food shortage and desertification leads to increase in migration flow. Migration has been recognized as an important facilitator of the spread of malaria. Prolonged droughts may lead to heavy population movements; thereby causing the young and the old to suffer stress and death. The problems with access to clean water go beyond health and sanitation issues, and uniquely affect women and girls. Children have been occasionally spotted drawing water from leaking sewages, oblivious of the dangers they are exposed to. The water load carried everyday is heavy and has caused chest complications to many locals especially those with low incomes. Some children have dropped out of school and to pursue water trading as a means of survival. Women in rural Kenya spend an average of three hours per day carrying water to their homes from distant sources. The time women and girls spend in water transportation significantly detracts from time they could spend in school or earning a viable income. No access to safe water: They depend on frequently interrupted central water supply systems from the government. No adequate waste water management resulting to polluted ground water. The rate of school drop-outs in girls increases during menstruation, this is because most of the latrines have no water, are located far from the school, have no privacy, and no hand washing facilities. Water supply is increasingly limited relative to demand. This is largely due to high population growth rates, water demand for irrigation and municipal use. The cost of fresh potable water can be Ksh. 20 - 25 per 20 litres. The prices mean that although water may be obtainable, the costs are very high and thus cause major economic hardships. Population growth is high and wastewater collection is expanding. Many towns are now implementing development projects for the improvement of municipal services and health conditions in their towns. Uncontrolled reuse is being practiced is some areas. Farmer’s divert untreated waste water from sewer outlets and irrigate vegetables that are sold in the markets. This could result in other food borne illness due to contamination. Surface streams have generally low flows and therefore relatively low assimilated capacities. Water pollutants from agriculture. Return flows from agriculture increases the salinity of the rivers and streams. An increased incidence of disease. The cheapest, simplest, and most effective solution to the rural Kenya water crisis is the construction of sustainable water harvesting systems. These water harvesting systems will allow women to dedicate more time to income-earning tasks, decreases the risk of disease from contaminated water, and provides greater access to a vital human necessity: water. Unfortunately, the simple, cost-effective, and age-old technique of rainwater harvesting has often been overlooked by large development institutions and requires the collaboration of grassroots organizations and communities with a dedication for change. Rooftop water systems involve three primary components: catchment, conveyance, and a collection device. The catchment device is the surface that captures the rainwater. In rural Kenya the catchment is the rooftop where rainwater falls naturally. Rainwater drains down the slanted roof top to the conveyance instruments, or gutters, at the base of the roof. These gutters transport the water from the rooftop to the collection device, which in this project will be the Rainwater HOG. The rainwater is then stored in the Rainwater HOG until its use. One portable Rainwater HOG storage tank holds almost 52 gallons of water. For the 130 Rainwater HOGs Amsha Africa Foundation intends to purchase and install, we will be able to capture over 6,760 gallons of water from rainwater that would otherwise go unused into the ground. If a woman can carry 5 gallons of water per day, then one Rainwater HOG storage tank can hold water that would have taken her over 10 days to carry. 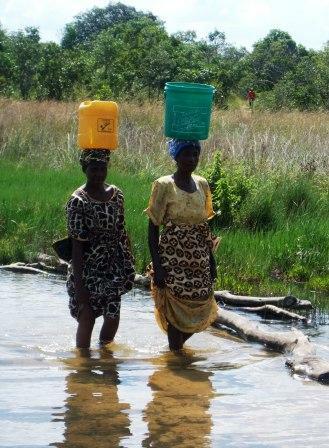 If she spends 3 hours per day carrying this water, a storage tank near the home can save her 30 hours of water transport over 10 days which results in 1080 more hours a year to do other tasks, such as entrepreneurial activities, daily cooking, cleaning, child care, and schoolwork. If she spends even half of those 1080 hours on work that earns even $0.50 per hour of income, this extra time can result in over $250 of income for this woman and her family. Ideally, each public and private building in rural Kenya should possess its own water harvesting system. This would maximize the benefits of rainwater and provide adequate access to water for all members of the community. With the assistance of donors, AAF will be able to cover the costs of purchasing, shipping, and installing these water-harvesting systems. Since it was noted that the increase in school dropout was directly linked to water shortage, availability of water will mitigate this problem. Most children spend more time going to fetch water, in the long run they end up skipping valuable learning time. Water availability will easily put a stop to this. Most stalled projects in rural Kenya, for example the Modambogo Health Center in Mwatate, Tumaini Women Self Help group project in Kisumu, Bee Keepers Association, in Taveta, cannot be commissioned due to lack of piped water. If water is availed, these projects can be easily completed and commissioned to serve their main function of helping the community. Successful implementation of the rain water harvesting system will help raise awareness on the benefits of water harvesting by quickly demonstrating how easy and effective the deployment of the rainwater harvesting system can be. To ensure availability of clean drinking water to the people in rural Kenya. The most basic use of water is drinking. Water is an essential element to our bodies. For many years communities in rural Kenya have not had access to clean drinking water. In some areas, boreholes that had been sunk produced either saline water, were contaminated and many have run dry. This has had a wider influence to overall socioeconomic activities. With clean rain-harvested drinking water, we will put an end to issues regarding health – waterborne diseases and ensure that the community member get direct access to clean drinking water over a long period of time. Through our research, we noted that many health centers in rural Kenya are non functional. With lack of piped water, these health centers cannot be able to run basic functions such as first aid, wound treatment among others. With water running, most health centers such as Modambogo Health center in rural Mwatate will be revived. The overall impact of this will be to ensure that the community members in the region enjoy good health. To achieve this, AAF teams in collaboration with volunteer doctors from the United States will be regularly running free treatment in attempts to completely eradicate diseases that can be avoided like Malaria, Typhoid among others. AAF is planning to educate the area residents on improved agricultural practices using rainwater harvesting and irrigation as a source of water. With very fertile soils, crop cultivation using rain water harvesting and irrigation techniques can be a success and the residents can put agriculture as an economic activity. Recycling of water can be used to irrigate crops and likewise curb issues regarding food security. Women in rural Kenya do majority of the household tasks. These include cooking, cleaning the house, washing clothes, crop cultivation among other tasks. Most of these tasks depend solely on the availability of water. With this kind of role playing, women suffer the most especially where there is lack of water. In such a scenario, a woman will be forced to wake up very early in the morning, walk over long distances to get water. Water vendors such as the local council’s water system are unreliable and many times some of these women travel long distances only to end up with no water. At times where water is available the women queue for long hours due unending demand. It is quite unfortunate that despite the poverty levels in most of rural Kenya, water vendors use monopoly to over price communities. A typical case in Mwatate town is where a 5 liter jerrican is sold at a price of 20 shillings. When the AAF team did a quick survey on water shortage in relations to education, much was deduced. For example, the Mzwanenyi Primary School in Mwatunge location records low turnouts of pupils. When queried, the pupils complain that their parents do not allow them to go to school since they have to remain at home and help in fetching water. Many areas that have issues with water shortage record poor performance in national examinations which can be attributed to low concentration by the students. Some of these pupils walk long distances to search for water, forfeiting hours of schoolwork. In an incident in August 2010, a pupil on his way to get water on a donkey driven cart was involved in an accident where a car drove into the cart, killing the donkey and badly injuring the child. This really upset the local community and the matter was reported to the local chief. If the issue of water shortage is addressed and solved completely, many of the school going children would be able to comfortably go to school without worrying about going to fetch water. Overall, this will help them concentrate in education and bring down the increased rate of school dropouts and improve the overall performance. The adults in the region complain that most of their time is wasted spending long hours going in search of water. Likewise, much time is also spent in the long queues for water. In such a scenario, most energy is channeled to unproductive activity. Man hours that could be put in productive activities such as farming is lost. Most farming land in the region lies bare because they are not cultivated. With the project kicking off, AAF will sensitize the community members on the importance of farming as an economic activity. Through irrigation, the farmers in rural Kenya can utilize the fertile soils to cultivate crops such as maize, beans and even cash crops. Below is the AAF implementation plan for the rain water harvesting project. Phase I through Phase V have been implemented. This is the actual start of the purchasing of the tanks from the manufacturer, shipping them to Kenya, and installing the rain water harvesting system in the various project sites selected. Overall monitoring of the project will be supervised by a special committee formed from the stakeholders and closely monitored by AAF field staff. AAF will monitor the management and use of water through partnering with community based organizations. For every project we complete, we document the work with GPS location data, a field report, and photos. We will set milestones for each phase of the project during the project and provide reports from our field project coordinator and the local water management committee (already formed) that has been formed to oversee the project. During the progress of the project, weekly meetings will be set to ensure all the participants are informed of the progress. The field project co-ordinator will be sending email updates with photo and video attachments (if possible) during and after the completion of the project. A media event will be held at the conclusion of the project which will include local media, local authorities, and the community that was involved in making the project a success. After the rain water harvesting system is installed, AAF field teams will explain to the beneficiaries how the system works, how to keep the system clean, and what to do if they have any issues. AAF will work close with Water Resources Management Authority and National Environmental Management Authority to ensure that the project meets international standards and would be able to serve generations to come. With facts and figures at hand, AAF is projecting that the project will be a success once implemented. Water shortage has been a major issue in rural Kenya over decades. This has been attributed to receding rainfall quantity over the years. Once this project is implemented, key sectors such as health, sanitation, education, agriculture and overall development will benefit. The evaluation period could go from 3 to 2 years and radical changes will be noted. Education is one of the pillars of development. Education is synonymous to development. For example, the Mwatate region visited by AAF field teams records very low educational indexes since most of the children halt education once they complete their primary education. Since the high level of school dropout is directly related to water shortage, with water availability, parents can be able to ensure that their children attend school. Major Health centers in rural Kenya have adversely been affected by lack of water. A good example is the Mwatate Health Center where a patient cannot be treated if he or she cannot come with a jerrican of water. Likewise, failed projects like the Modambogo health center would be revived with availability of water. Water fed cultivation (irrigation) if sensitized as opposed to season based agriculture can ensure areas in rural Kenya that have water problems experience abundant harvest all year round. This can boost the agribased economy of the region and can be a good source of income to many farmers located in the region. After the completion of each rain water harvesting project, AAF will officially hand over the project to the water management committees in the rural communities chosen for this project. The community members in these committees will be tasked to overlook the sustainability of the project. AAF will closely monitor the management of the project through frequent visits to the site and have a permanent representative in the water management committees formed who will be reporting to AAF. Ensure that the equipment at the project site is secure all the time. This can be done by hiring a guard who will not only secure the perimeter but also ensure that the equipment is serviced regularly if needed. In the onset of wear and tear, AAF will ensure the contracted engineer will always be available to do repair work, out of the contract agreement signed. The AAF team will work with the local authorities such as chiefs, district officers, and community elders through community policing to ensure that the installed equipment are secured from vandalism. Strict actions will be taken on offenders and the community will be educated on how important it is to care for the project through constant barazas (meetings). Community participation in management of the project will achieve this. To ensure long-term sustainability of the project, private investors, individuals, the council and even government agencies will be encouraged to pipe and tap the water and pay monthly fees to ensure sustainability of the water. These fees will be able to cater for servicing and basic repairs that might be experienced over the years. With time, the committee can expand the projects depending on the demand from both the locals and the clients.